Stainless steel Rolex Date in with smooth domed bezel and Roman numerals. 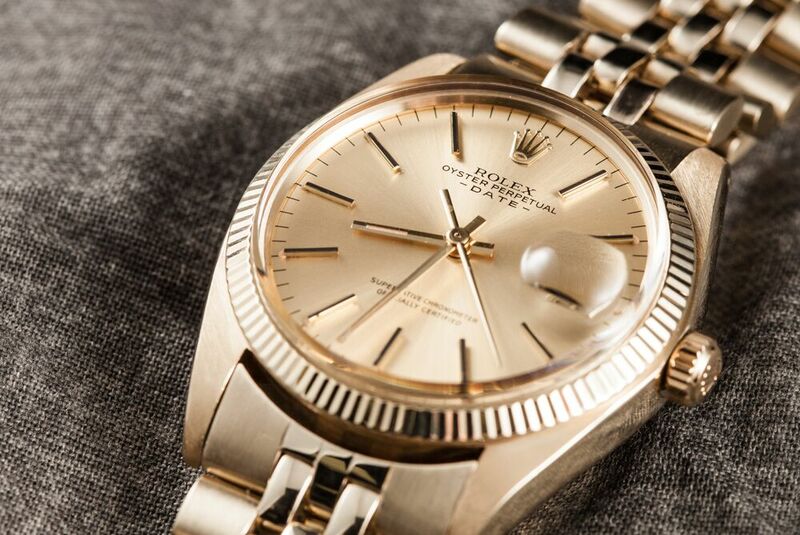 Launched in the early 1960s, the Rolex Date is a smaller alternative to the flagship Rolex Datejust collection. Sized at 34mm, it is 2mm smaller than the men’s Datejust case size at 36mm. Although originally conceived as a man’s watch, considering current watch trends, the Rolex Date is perfectly suited for a woman’s wrist too. Stainless steel Rolex Date with silver dial and engine turned bezel. 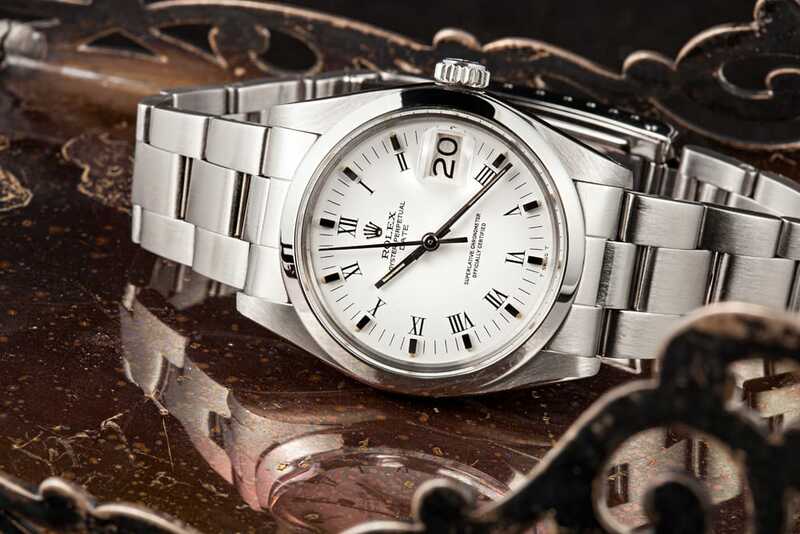 Just like the Datejust collection, the beauty of the Rolex Oyster Perpetual Date series is its versatility. Metal options of the Date range from understated and sporty stainless steel to precious 18k gold and they can be presented on either Oyster bracelets or Jubilee bracelets. The bracelet end link of a Date measures 19mm wide rather than the 20mm width of a Rolex Datejust bracelet. The bezels of the Date include sleek smooth domed, classic fluted, or intricate engine turned. The baton-style hour markers or Roman numerals on the dials are accented with small luminescent plots and the hour and minute hands are luminescent too. Yellow Gold Date with fluted bezel and Jubilee bracelet. As the name suggests, the Rolex Date comes equipped with a date window at 3 o’clock, which is magnified by the Cyclops lens affixed to the plastic crystal protecting the face of the watch. 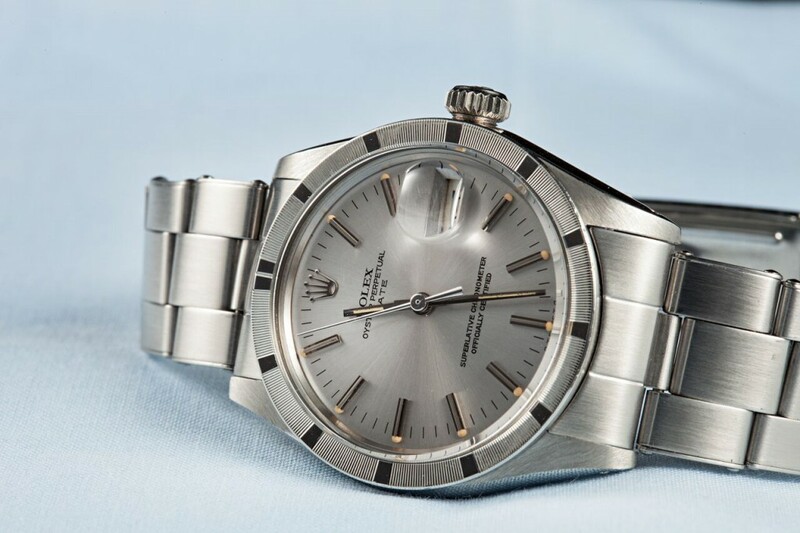 However, since Rolex introduced the QuickSet date function in 1977 — where the date can be easily changed via the crown without moving the center hands — most, if not all, Rolex Date watches are non-quick date. Stainless steel Rolex Date with smooth bezel and baton indexes. Being part of the Oyster Perpetual family, the Date is, of course, waterproof to a depth of 330 feet (100 meters) thanks to the screw-down winding crown with Twinlock and the screw-down fluted case back. The case safely protects the Rolex Caliber 1565/1575 automatic mechanical movements within. Each Date is a COSC-certified Superlative Chronometer Officially Certified. 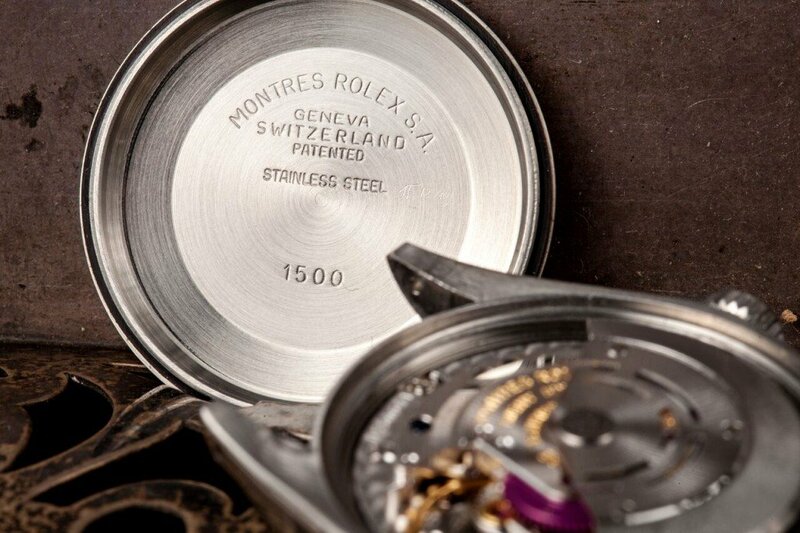 Caseback and automatic mechanical caliber of the Rolex Date 1500. 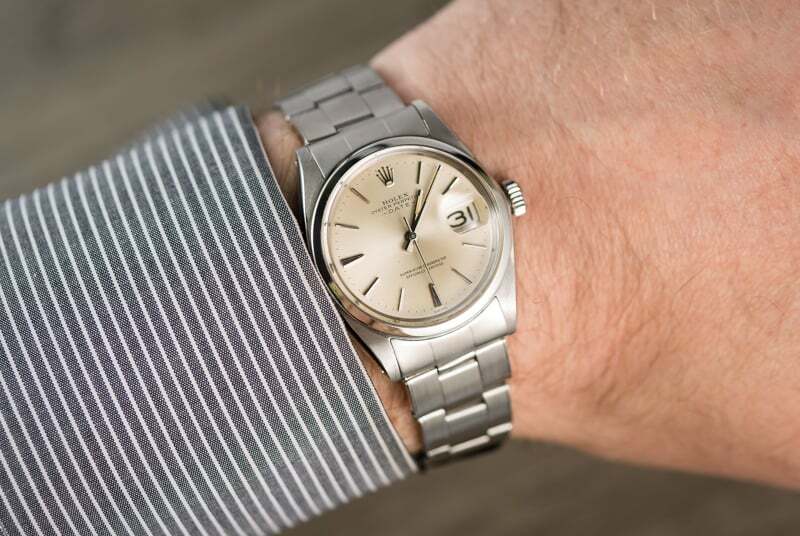 In terms of styling, the Rolex Date is very similar to the older versions of the Rolex Air-King except for the addition of the date aperture and corresponding Cyclops lens. The Date watch is also of course, very similar in style to the Rolex Datejust as well, just with a smaller case and thinner bracelet. 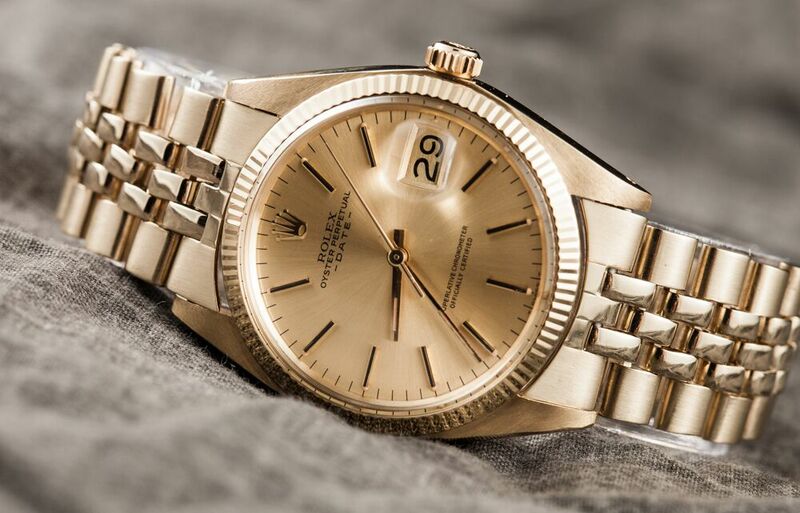 So, the Date can almost be considered as the middle brother between the Air-King and the Datejust. Yellow gold Rolex Date with fluted bezel and Jubilee bracelet. Perhaps not as popular as the Datejust, the Rolex Date is nevertheless a classic, albeit smaller, Rolex dress watch for men and women.